The RegTech industry is buzzing: innovation has transformed how we use regulatory technology to deal with ever-increasing requirements and obligations from financial regulations. Who are the people though that move the sector, are the most active on social media channels, blogs and industry events? 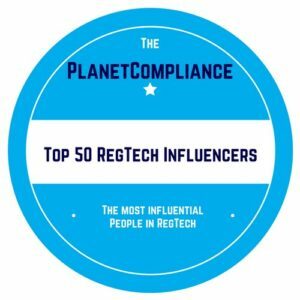 You know we love lists at PlanetCompliance, so we’ve put a list of people together we think are the key influencers in the field and know what they are talking about when it comes to RegTech. Our scoring algorithm considers the activity across the web and social media channels based on an individual’s Klout score that combines data, for example, from Facebook, Google+, Instagram, LinkedIn, Twitter, YouTube, and Wikipedia. The algorithm also considers other aspects like how often the individual is mentioned across the web and in the press. And, of course, there is a secret ingredient we’ve added.